Parents often tell their children that with a little bit of hard work, they can do anything they dream of. Ben Kanute definitely took his parents’ advice to heart: as a young spectator at his father’s triathlons, Ben aspired to be like him. Flash forward 16 years, and Ben is one of the three males representing the United States in the Olympic Triathlon this summer in Rio, Brazil. Growing up in Geneva, Ill. but currently residing in Tucson, Ariz., Ben feels lucky to be able to combine his three favorite sports, swimming, biking and running, into one. “I can’t pick one sport and I think that’s the reason why I continue to do triathlons,” Ben says. Ben has been dreaming of standing on an Olympic podium since he was sitting in a classroom at Marmion Academy in Aurora. And now, at just 23-years-old, Ben can almost feel that heavy medal hanging from his neck. Triathlons have been on Kanute’s radar since before he could ride a bike. His father, Michael, first competed in the Chicago Triathlon in 1994, when Ben was 2, and continued to compete for several years after. Ben joined a local swim team at age 7, and his mother, Eileen, co-organized the first Delnor Kids Triathlon, now called the MMTT Youth and Elite Triathlon, in Geneva in 2001.The first annual race was also Ben’s first triathlon. About a year later, Michael’s friend started a local youth triathlon team called the Multisport Madness Tri Team, which introduced Ben to the Olympic style of racing. Ben’s younger brothers, Josh and Nick, have also grown up with triathlons, and participated at young ages. From there, Ben became much more competitive, and was named the 2007 USA Triathlon Youth Elite National Championships winner and earned the USA Triathlon Junior Elite national titles in both 2008 and 2010. Ben also represented the U.S. at the 2009, 2010 and 2011 International Triathlon Union Junior World Championships, and began traveling the world for different races. And the traveling is one of Ben’s favorite parts of the sport; in fact, he says that seeing different places around the world has helped him create his own bucket list of countries he’d like to visit again. After graduating high school, Ben knew he wanted to pursue triathlons in college, which ultimately influenced his decision on which school to attend. While his training took up much of his time, Kanute kept up on his studies and graduated with a degree in physiology in just three years. He then began the extensive process to try and qualify for the Olympics. Basically, it works like this: one way to get in is to automatically qualify at specific races, but none of the U.S. men did that this year. 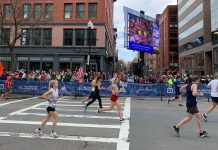 Next, they take each athlete’s best two out of five race times from the past five months, and pick the team from those with the fastest results. It goes back even more, Ben describes, but it’s complicated to determine other ranks to get into those races. “To be considered for an Olympic team takes a lot of consistent performance, and for me it took a lot of consistent improvement to reach the level of racing to get the right amount of points to qualify,” he says. Michael remembers watching the race in which Ben officially qualified for Rio this past May; the race was in Yokohama, Japan, and with the time difference, it began at 11 p.m. Central Time, and didn’t end until 1 a.m.
As the games get closer, Ben remains busy. Before August, Ben has competitions in California, Florida, Colorado, New Mexico and even Germany. He’s very excited for Brazil, though, simply to experience the atmosphere of the Olympics. The Olympics officially begin on Aug. 5, but the triathlon takes place at the end of the two-week competition, so Ben and his team won’t head to Brazil until after the games have already begun. Luckily, they were given the opportunity to familiarize themselves with the Rio course last year, when the team went down for a dry run of the race. The Olympic triathlon is a 1.5 km (0.93 mi) swim, 40 km (27 mi) cycle, and a 10 km (6.2 mi) run. While he obviously plans to compete his fastest, Ben explains that this race will not be so much about time as it will be about how others are performing. Because the main goal is to get a medal, “everyone’s looking at each other” to try and place in the top three, rather than competing with their own past personal records. 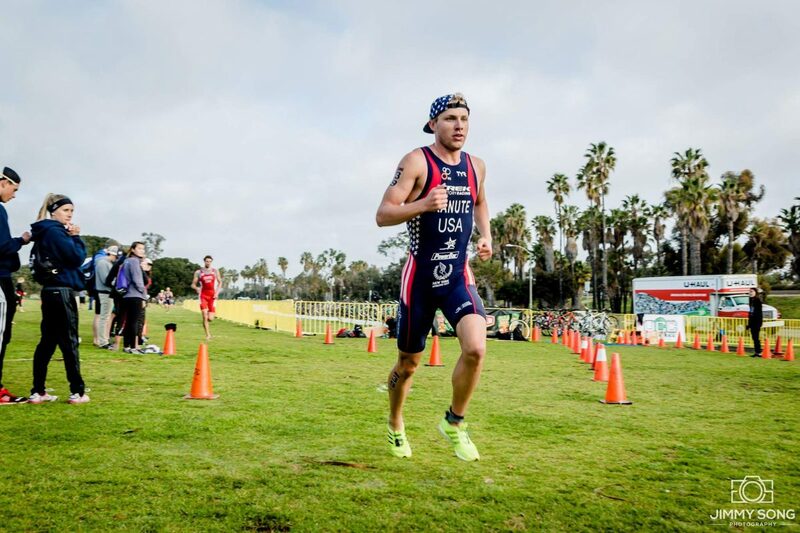 The other two U.S. qualifiers on the men’s triathlon team, Greg Billington and Joe Maloy, have been training in San Diego, leaving much of Ben’s training up to himself and those around him. 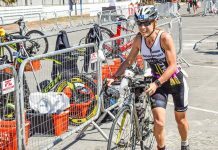 Because triathlon is an individual sport, Ben explains that he thinks this setup works well for his training, as he is particular about the different workouts he does. 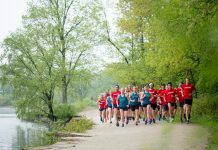 As far as coaches go, Ben has an entire squad; he has a different coach for swimming, bicycling and running, along with different mentors and a sports psychologist. However his coach Ryan Bolton, who competed in the Olympic triathlon in 2000, is one of Ben’s biggest role models. Additionally, Adam Zucco, who introduced Ben to Bolton, has been his coach since his youth triathlon team. Although he hasn’t lived in Illinois since before college, Ben still values his family more than anything. He attributes much of his success to his parent’s support; both of them have competed in various triathlons, including the Ironman, so their understanding and love of the sport not only introduced him to the triathlon community, but motivated him to continue competing. Michael and Eileen still live in Geneva, and his brothers are both in Wisconsin. Despite the family’s physical distance, they remain close at heart. Come August, the Kanutes will reunite to travel to Rio and watch Ben compete, along with other friends and family. “Geographically were not close anymore. All of the boys are out of the house, but I still consider myself very close, and obviously a lot of that grew out of the sport,” Michael says. In fact, Josh, the middle Kanute son, travels to San Diego to train with his swim team every year, and Ben often joins to train with him and his team, according to Michael. While Ben has his own support network, he makes the effort to support others as well. While he plans to return to Tucson after the games, Ben will be making several trips to Chicago to see his family. He also has quite a few more races on his agenda through October, when he will then allow himself to enjoy his other hobbies of watching Netflix and drinking coffee. Root for Ben when he races at 9 a.m. CT on Aug. 18 in Rio, Brazil on NBC. The women’s triathlon is at 9 a.m. CT on Aug. 20.